In the end of 2017 Ekahau released a much anticipated update to the Site Survey tool. Keith was able to sit down with Senior VP Jussi Kiviniemi to talk about what was new and what can be expected in the future. Below is a summary and highlights of their conversation. You can listen to the original interview HERE. Jussi, how are you doing today? I’m doing fantastic! Thank you! How are you, Keith? I heard you have a new upgrade to your software? Do we? It’s the stuff Mikko Lauronen does and he doesn’t tell me. How do those requests end up getting into the next version of the software? What’s the process? Alright. So, two folded questions. Let me get the sales pitch out of the way and then we can talk about the actual stuff, is that fair? Of course, sales pitch away! All right. 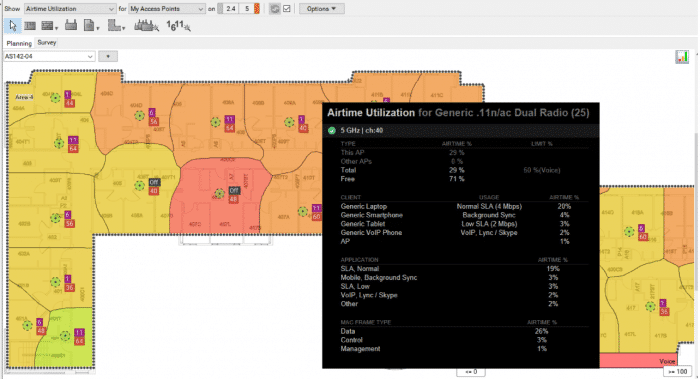 So, we released ESS 9.0 Ekahau Site Survey and Planner 9.0 and this is really an upgrade primarily for the planner part of things and traditional one. Let’s say a case study of the industry needs something and then we try to understand the big picture and come out with something that solves the big picture for as many people as possible. So ESS 9.0 brings advanced capacity planning and it has few things on it. First of all, it has the all-new automatic planner. So the previous Ekahau Site Survey automatic planner, which basically places the access points for you based on your requirements on the map or several maps at the time and then it configures automatically the channels of the APs and stuff like that. It had a couple of shortcomings. Number one – it overpopulates the amount of APs in high-density scenarios. They do but let’s not go into that. The second thing is the tool did not account for a single project like in high-capacity areas versus low capacity areas. So, if you had a school with classrooms and then you had a few lecture halls that required really high capacity, but the classrooms required less, you could not define that in the tool. You couldn’t really validate whether it’s gonna work or not. The new ESS 9.0 gives you the ability to easily draw different zones on the floor plans. Like in this lecture hall, I’m gonna need 900 students to be served with their iPads and laptops. Then, In these classrooms, it’s gonna be 30 laptops per classroom or whatever. It makes it super simple. It used to be a bit cumbersome UX wise in the old version. Now it’s very easy and streamlined. That’s the new capacity planning nature. Also, the other part is like, “how do I make sure that the capacity is sufficient?” For that, we brought the airtime utilization heat map, which accounts for the amount and distribution of clients, the types of clients and how many spatial streams. All of those basic things and applications which run on the clients, how often and what kind of isolations are required. But, it also accounts for new things that were missing in the previous version like the number of SSIDs. Do I have legacy data rate enabled or not and which one’s band steering? 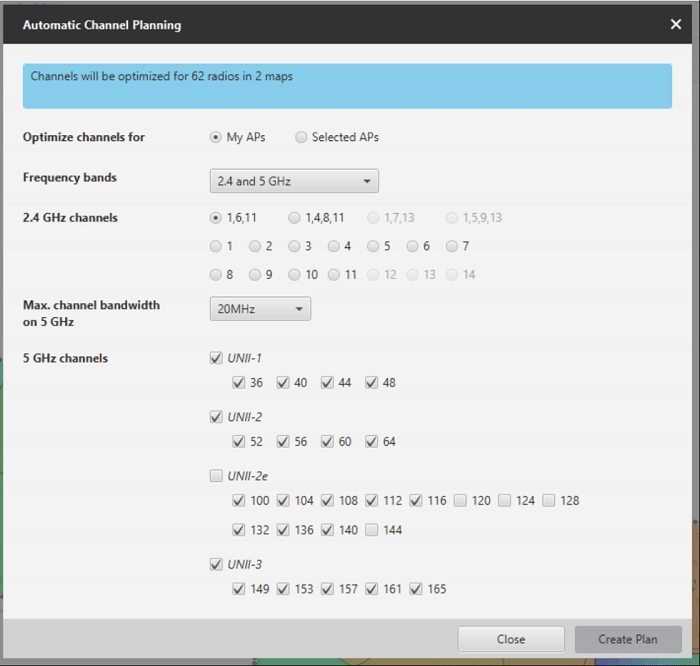 Then, the tool completely now supports Dual 5 GHz as well as disabling 2.4 GHz radios, including the auto planner. The auto planner automatically disables 2.4Ghz radios or converts them into Dual 5 GHz. It automatically avoids hallway placement, bathrooms, and elevators. It just knows from the floor plan layout. So it has a ton of new improvements, but it has been like four years in development. The tool completely now supports Dual 5 GHz as well as disabling 2.4 GHz radios, including the auto planner. So in the past, the capacity planner had features about airtime and how many down to the minute level? How many minutes was Voice over IP going to be used? But you’ve meant that you can use capacity analysis in the old version based on if you collect data from a post-validation survey? Will this new capacity planner also have that same type of reporting on post-install validations? Yeah! For example, you can do a site survey of an existing network and then throw simulated capacity at the network and all that works just like it did in the previous version. So you do get the analysis side. You’d mentioned it was basically about planning. But you could use that same feature in a post-analysis? Absolutely! For fine-tuning the network and dropping those low data rates, seeing its impact of dropping your number of SSID from 63 stuff like that. So it’s a plus and it will be nice for you Keith as an Ekahau Certified Survey Engineer Trainer. Your team Eddie, Devin, Blake, Sam, and everybody can illustrate very easily how Wi-Fi works and what are the major contributors to airtime utilization, which is the key to Wi-Fi performance. What degrades it the most and what makes better things like that. So you can play a little with it? What if I lowered my data rates? Stopped having low data rates, what’s the effect on capacity? I’d love having “what ifs”. Spreadsheets are great for learning things and so far Ekahau has been wonderful for learning other things about Co-Channel Interference. One of the issues with the old planner was like you mentioned, too many AP’s having Co-Channel Interference. So Co-Channel Interference is now a requirement of that process? Not really the requirement of CCI. It’s more like trying to avoid it as much as possible. So the tool now understands that CCI is bad. Do not or stop populating APs. Stop adding APs where it doesn’t really make sense and start converting radios on 2.4. Either disabling them or turning them to Dual Wi-Fi once you start seeing CCI where you require advanced AP placement. Well, one of the last upgrades added is the ability to do copy and paste. It’s been asked for a long time. A lot of people have asked the #ESS request. How did other #ESS request get into this 9.0 release? Coming to your original question, I guess it’s about the process of how this works. Is it just magic? You write it down and instantly it’s coded in the next version. Yeah exactly! That’s a many-folded question. I guess there are lots of things. Let’s start with the #ESS request. Often these are a single feature and somebody asked for them. Copy paste is a perfect example of something that’s really necessary for the user and clearly, it needs to be done. There’s pretty much one way of doing it right. That’s what we tried to do. So that was pretty simple. Then we’d get an enormous amount of these and by the way thanks to you and the community. Does it help just from the community standpoint? If someone asks for something any #ESS request and 20 people also say it. Does that give a little more weight and priority? How does that priority process work? Absolutely it helps. So, of course, there are more frequently asked things and what increases the weighing is if people explain the used case scenario for it. Sometimes you just hear at this button or at that button or slider and the context might be missing. But usually they are brilliant – the requests. But the more context we have on the request, the better we can understand the situation and implement it. So, that it helps not just this particular user, but how it helps the community. How does it help the fifty thousand customers as well as the single user? …Usually, they are brilliant – the requests. But the more context we have on the request, the better we can understand the situation and implement it. So, that it helps not just this particular user, but how it helps the community. So #ESS request obviously on Twitter’s limited 140 characters is less. How would someone go about giving you that context and writing up perhaps a longer request with an explanation of why? They can send their request to [email protected]. Mikko is our product director. I think the first starting point is our support team ([email protected]) because they have direct access to our future management system, they initially put in the feature request and they also understand the context and they can explain it a bit more. It’s not just about reset my license. These guys are actually Wi-Fi experts that have gone through your training and CWNP training and stuff like that. So, that would be a good starting point. #ESS request is one thing, right? But then there’s also like where the industry is going. That’s a bigger thing that we also need to look at and that’s why we have, for example, guys like Chuck Lukaszewski and the same signal guys really pick on. They’ve come in and talked about the future standards and how they’re gonna influence the Wi-Fi as a whole and the industry. It’s primarily about the need to educate our customers and give them good content. But it’s also for us to learn and understand and continue those discussions with those guys on where the world is going? How are these standards deployed and designed in the enterprise? When and how should we bring those standards to our products? That’s what we’ve been talking with you. For example, today we touched on some of the standards and how they’re gonna work like 802.11ax and stuff like that. Then there’s the internal innovation which is something that people usually patent. The thing that’s relevant is what we need to combine on our engineering expertise. With our expertise in understanding the market and the customers and we combine that and try to come up with big significant features that would then help a ton of people. But features that nobody actually directly asked for. And that’s like a big pile of the competitive advantage hopefully comes from something like that. we…try to come up with big significant features that would then help a ton of people. But features that nobody actually directly asked for. And a lot of our listener’s who think of themselves as Wi-Fi Professionals have a set of tools and experiences and knowledge, but they’re not your only market. You need to make a tool that goes out to a broader audience and thus I can see how some of us will ask for something that might be useful for our little niche but you’ve got to make things that go out for everyone. Yeah, that’s the difficulty because there are guys like you, Blake, Sam and Jake Snyder and there’s a couple of hundred people that are or let’s say 500 or so, but this made maybe 30 of these really core guys and then 500 really Professional Wi-Fi Designers around them that are very vocal. Somehow if we need to serve you guys because you’re kind of the original guys and you also have a ton of influence in the industry, but you’re exactly right so then there’s those 50,000 other guys or hundred thousand or million other guys that also should be able to use the product. If we made a product for you and Devin, it would look quite different from what we made it for an IT administrator in your local school. And whatever you can do to help stop bad Wi-Fi, we’ll go for it. I really appreciate that. That’s the goal, right? Well, ESS 9.0 now available and ready for shipping. If someone is currently an ESS user, what’s their process of getting upgraded and if they are or not underneath the support, how do they get these new features? Those that are under support the next time they fire up ESS, it will suggest downloading a new version and the installer will run and they will have the latest and greatest features. Those that don’t have support, I should probably contact our Ekahau representative at [email protected] or just go to our online store if it’s available in your country. Buy from there or contact your local distributor and purchase additional support. It’s a pretty straightforward procedure. Sorry, can I add one more thing? I’d really like to give a big shout out and thank you to everybody who has been communicating with us, contributing to the features that are in the product. Without you guys, there would be nothing in the product and I appreciate how active the Wi-Fi community has been around us. 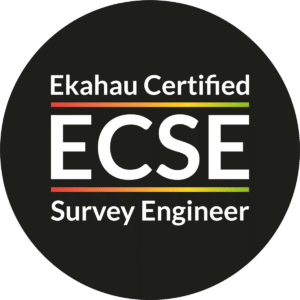 There are also users asking about the Ekahau Certified Survey Engineer (ECSE ) that you, Devin and Blake have trained for a long time. How many people on it? Job well done, sir! So this is a very active community of people that help us shape the product and the industry with we’re trying to share with those guys and then there’s the Ekahau Masters, right? Well, what do you think of that and that group’s importance? Well, last year, we had the first Masters and it was a chance for a subset of the community to get together and give feedback directly to Ekahau. I think you did a wonderful job of setting up a scenario where you asked us questions and set scenarios where we would even pretend we’re a product manager for an afternoon and help you build whatever the next product is. One from being on the Masters on our site, it felt good that you were listening and seeing the results of some of those things we talked about actually show up in a product. That makes you feel like “Oh they’re actually listening” and it turned into a real product. Now, of course, we did some pie-in-the-sky ideas of something you could put on your head and virtual reality survey. Yeah, you’re not going to get all those, but it allowed us the chance to get together with other people who are in the industry and talk about it. I can see how it’s really good for Ekahau from a feedback standpoint. It’s good for the community to realize that you’re asking us to help you with that feedback process. And it gives you the opportunity to eat a lamb two times a day, right? At least two. You could eat for breakfast too. That was an inside joke when we’re in Iceland the restaurant. Thanks for coming on and talking about ESS 9.0. If anyone wants to upgrade next time, you click ESS and it’ll come up and ask for an upgrade and if you’re not currently under support, you should be. Thanks, Keith for having me on. Again, I really do appreciate that and a big kudos to you on what you’re doing in the community whether it’s training the conference. Isn’t WLAN Pros Conference coming up soon? The conference is in Lisbon this year. Every year we hold the European one in a different location since people move it around. Sometimes we pick weird places like the original but Berlin and Budapest were great and now we’re moving a little south to Lisbon. It’s October 3rd and 4th and we would be glad to have as many people come as possible I’m sure your team is gonna be there. 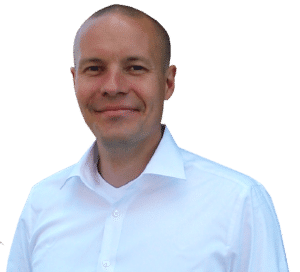 Jussi Kiviniemi is an SVP @Ekahau. Advisor at Spark Sustainability and interested in Strategy / Product / Evangelist & influencer marketing. Have more questions or feedback? Connect with Jussi via twitter.